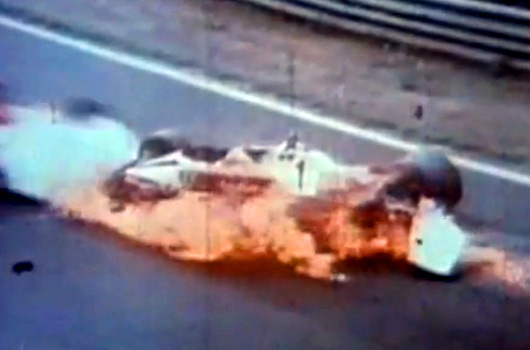 It’s now over 30 years since Niki Lauda‘s horrific accident at the 1976 German Grand Prix held at the Nürburgring. In a recent article for the TimesOnline Austrian journalist Helmut Zwickl recounts the events. It is a moving article that truly brings home the dangers of motor racing, especially from an era where safety was something thought about after the cars were designed. Indeed, Lauda himself had been campaigning for improved safety measures at the Nürburgring before the race. And so it was some irony that Lauda crashed his Ferrari on lap two. Amazingly, despite the severe burns and following reconstructive surgery, Lauda, still leading the world championship, returned to Formula 1 racing just six weeks later. He missed only two races and took the wheel of his Ferrari at the Italian Grand Prix. Not only that, he narrowly missed a podium finish when he completed the race in fourth position. The final race of the year in Japan was held in heavy rain and Lauda withdrew from the race due to safety concerns. This action probably cost Lauda his world title as James Hunt scrambled to a third place finish and in doing so the Briton took the title by just one point. Shortly, I will post up a 13 page German article on Lauda’s accident which will have selected text translated to English. It contains some graphic and confronting pictures of the crash, but I feel is worth posting as this incident plays such a large role in the make up of the Nürburgring’s aura. Below are two clips of Lauda’s accident, the second is from an Italian TV interview, but also has some extra footage showing the actions of the drivers assisting Lauda from his car. Was it caused from leakage from the car in front of him? Tranzlazione por favoro pizza!